The major airports of Scotland are Glasgow, Edinburgh, Aberdeen, Prestwick and Inverness. Scotland also has numerous smaller airports. 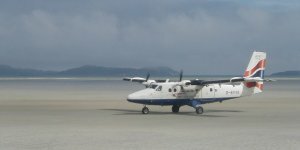 Many of them are on the islands, some of which are little more than gravel airstrips – while the one on the island of Barra is the beach! Highland & Islands Airports operate 10 airports in the North and West of Scotland including Inverness, the capital of the Highlands.